Marathon Finishing Systems, Inc. Specializes in the engineering, manufacture, and installation of industrial spray paint booths, blasting/grinding booths, mixing rooms, service bays, and specialized finishing systems. Our products are used for surface preparation, coating, painting, and finishing applications by virtually every segment of industrial production and manufacturing where high quality finishing is required. We also provide full “Start Up” and training after installation. Scroll down to find out more. Engineered for industrial applications, built for strength and durability. Tailored to meet your needs, and exceed your expectations! Powerful and compact, these mobile dust collection units will keep your work clean, and your air safe to breathe. Arguably the most versatile and productive booth designs available! Fully customizable, so it fits your needs perfectly! Engineered to withstand the most rigorous beating that nature can muster: Heavy duty components, steel re-enforced, built to last. Fabrication and prep are dirty jobs! We will help you meet safety requirements, and keep the dirt and dust to an absolute minimum. Nearly two decades of designing, building and installation experience. We will put all that knowledge to work for you. An innovation that may be THE ONLY solution when you need to be mobile. Increased production and a superior finish. 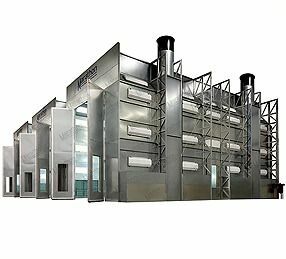 We offer the most modern, efficient, and well built heat systems available! 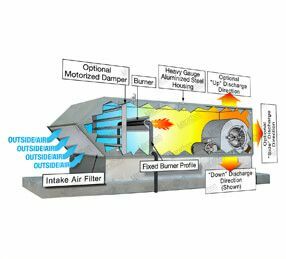 Sandblasting is work that destroys all but the TOUGHEST equipment. Woodworking has very specialized finishing needs, so we offer models designed with woodworking professionals in mind. 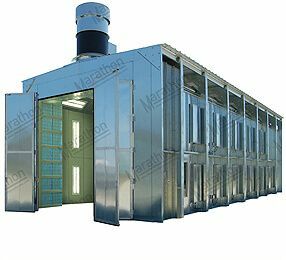 Marathon Finishing Systems, Inc. has been built a reputation of manufacturing quality spray paint booths that out perform expectations and setting benchmarks in the industry. Over 50 years of manufacturing and design experience go into every spray paint booth, oven and related solution we make. 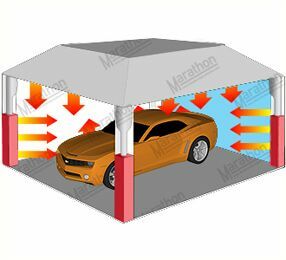 Whether you’re looking for an Industrial spray paint booth, Automotive refinishing booth or Truck and Equipment paint booth, Marathon has got you covered. 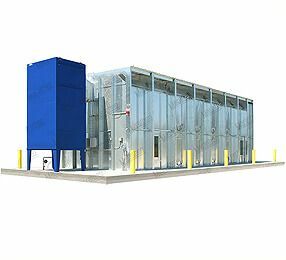 Our line of self-contained small parts booths (no ducting required) and portable container booths are used in many different applications including painting, grinding, powder coating, and in industries from automotive to aerospace. Marathon manufactures our affordable equipment right here in the US. Our equipment is designed and built to provide dependable performance with maximum efficiency, year after year. We use only the highest quality parts and components in our manufacturing processes. We are a full-service company that designs, builds and installs (or help you install) whatever you need. 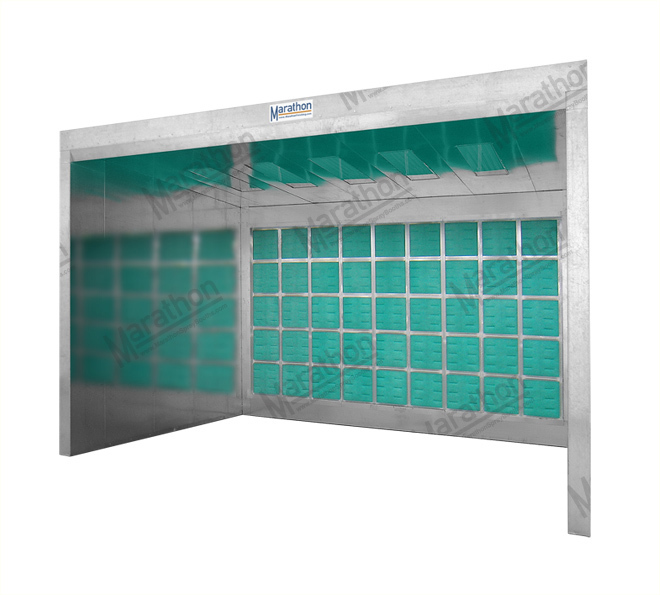 We manufacture many types of booths: Cross Flow, Semi-Down Draft, or Downdraft… heated or non-heated systems that can be placed indoors or outdoors. Marathon can custom design and build your booth at a reasonable price with a quick turnaround. We are with you from start to finish. Our experienced team can start by helping you decide which booth and equipment works best for you and your specific application, and we will be with you until your spray booth system or equipment is installed and working. We will even train your staff in the proper operation and maintenance of your new equipment! Our automotive, truck, and equipment paint booths are available in five different airflow styles to best match your needs and your application. Whether you’re looking to save space or you need an outdoor rated booth, you can find it online here. 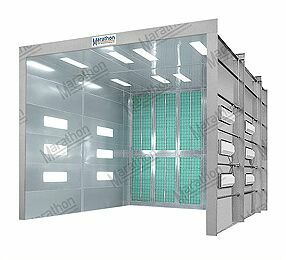 Marathon’s high quality powder coating booths deliver reliable operation you can count on day after day. 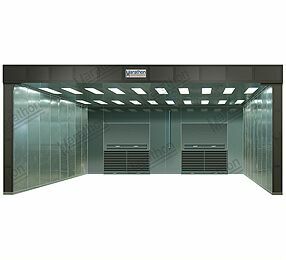 We provide large and small powder coating booths, hi-efficiency ovens, 3 stage filtration booths and more. Plus, we supply powder spray guns, filters and even more supplies all in one convenient online store. Our portable spray booth series is designed to be a transportable finishing solution, without sacrificing quality, utility, or functionality. We strategically position all of our light fixtures to help eliminate shadows. Our transportable booths comply with all national environmental, fire and safety codes. 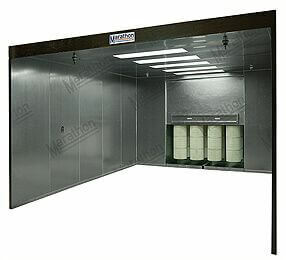 Portable spray booths are completely self-contained and easy to connect. When you’re done, you can move from site to site with ease. Whether your business is large or small, we provide high-quality industrial finishing booths for commercial applications with an impressive service life. No matter what industry, our experienced team can help you find a booth design or engineer a customized solution to fit your needs at a reasonable price. We didn’t become a leading spray paint booth manufacturer by chance. We have set the benchmark for performance and service that our competitors cannot match. We build top quality products, and we continuously strive to provide you with the best overall customer experience possible. Our dedicated team will be with you from start to finish so you have expert help every step of the way. If you have questions about our spray booths, or you are ready to place your order, give us a call at 1-800-919-9035, or submit a “Request for Quote” today.